Standing water on your lawn not only looks bad, but it kills your grass, is a breeding ground for insects and can even cause erosion. Proper lawn drainage is a crucial part of any yard planning, especially here around Atlanta. If you’ve noticed standing water on your lawn after a rainstorm, be sure to keep an eye on how long it takes to go down. Then when it rains again, go check the area to make sure it wasn’t a one-time occurrence. There are many ways to find the source of your lawn drainage problem, but let’s look some of the most common. This one is simple and is the root of most problems. Gravity will always pull all your water to the lowest point of your lawn. If that point is in the middle, you’re going to have a sloppy wet mess right up front. Take a look at where the rain gutters on your house are running off. Most do a good job of diverting the water away from your lawn, but more times than not there’s an errant gutter causing issues. Just like gutters, driveways are usually made to keep water from flooding in your yard, but this isn’t always the case. After the next storm check to see where the water is running off the driveway. At Hutcheson Horticultural, we’ve been saving lawns from flooding for years, and we’re here to help you. You will receive professional and prompt service, from a team that has seen it all. 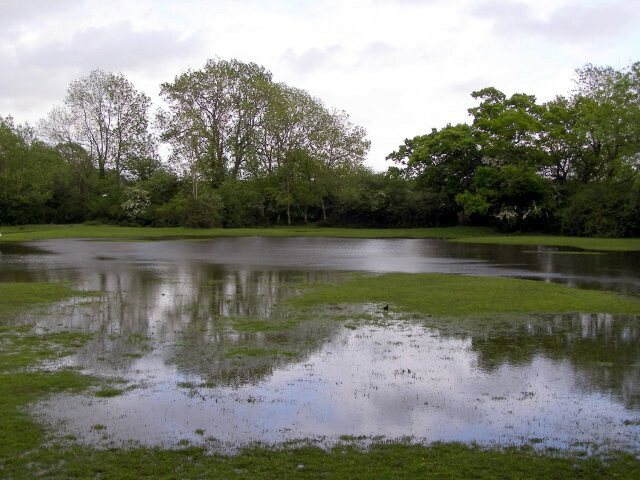 Don’t let standing water ruin your lawn!